Halloween : The Pirate’s Curse is a superb HOG full of highly original scenes with lots of puzzles & mini games. There’s a Shopping Mall, Witch’s house, Halloween Fairground, Pirate ship and much more. The guys go Trick or Treating and see pumpkins and skeletons, witches, bats and ghosts all over the place. At the Halloween Fair they ride Bumper Cars, the Ghost Train and visit Dracula’s amazing Castle. But things are about to change as the Pirate casts his Spell over the Fair. Suddenly they are inside the Ghost Train and Without a car, Yikes ! They escape but can’t believe it, the Fair has been transformed into a spooky and ghostly place. They visit lots of rides and keep finding gold items. Using a Treasure Map they find the Pirate ship and get the Captain to lift the Curse. 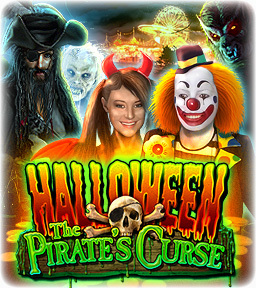 Halloween : the Pirate’s Curse is a highly creative game that will suit players of all ages. A New skill game gives you points based on your reaction time and there’s a hi score table to show family and friends.